The last few days and weeks away from the Finnish parliamentary election with a little help from the Finnish media vultures and via telephone to housewives telephone surveys the prejudice and xenophobic True Finns Party has exposed themselves encouraged from the unbelievable 18% they give them. 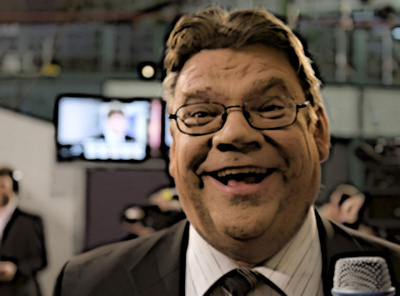 Their leader Timo Soini gives one interview after the other reminding not only what they really represent beyond populisms but moments of the darkest European and global past. The True Finns master the art of misrepresent history even when it comes to the Finnish history, unfortunately even the schools and the state have contributed for decades misleading thousands of Finns but Timo Soini is not the first that talked about …pure art that strengthens and projects national identity and he was not the first to go after modern art and literature. Adolf Hitler and Joseph Goebbels were the first. Historical facts, On 6 April 1933, the Main Office for Press and Propaganda of the German Student Association (Deutsche Studentenschaft) proclaimed a nationwide "Action against the Un-German Spirit", which was to climax in a literary purge or "cleansing" ("Säuberung") by fire. Local chapters were to supply the press with releases and commissioned articles, sponsor well-known Nazi figures to speak at public gatherings, and negotiate for radio broadcast time. On 8 April, the students association also drafted the Twelve Theses which deliberately evoked Martin Luther and the historic burning of "Un-German" books at the Wartburg festival on the 300th anniversary of the posting of Luther's Theses. The theses called for a "pure" national language and culture. Placards publicized the theses, which attacked "Jewish intellectualism", asserted the need to "purify" German language and literature, and demanded that universities be centres of German nationalism. The students described the "action" as a response to a worldwide Jewish "smear campaign" against Germany and an affirmation of traditional German values. Is this what the Finns want? Are they going to start with KIASMA or Ateneum? What about Alvar Aalto? And when it starts the books' burning , don't forget Väinö Linna's "Täällä Pohjantähden alla" there are some bitter trues in this book about the ...Finnish identity as Soini imagines this True Finnish identity.